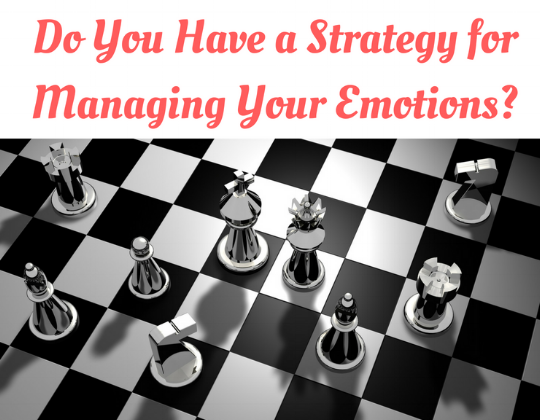 Do You Have a Strategy for Managing Your Emotions? With admiration, I listened to my husband’s earthy self-awareness. He emerged from a lengthy, frustrating, discordant meeting—a total waste of his valuable time—and declared his determination to let it go. Even though the discussion robbed him of a much-needed slice of his morning, he knew better than to let the experience burn up the rest of his day. In other words, he knew how to proceed. The baggage in my brain created an uncomfortable disturbance. I desperately needed to move forward and maximize my day, but the negative emotions inside of me clung like barnacles. My husband's approach was appealing, but how could I get there? Obviously, this matter required further contemplation. Emotional maturity is far more complex than simply inserting an emoji into a typed text. Managing our feelings is a desirable goal to pursue, but not always easy to achieve. Acknowledge emotions. Bring them to the light; stuffing emotions is dangerous and unhealthy. Enjoy emotions. When they are high, enjoy the ride. Don’t trust emotions. They can be fickle and are subject to change. Pray through emotions. All along the spectrum, emotions need to be taken to God. Prayer 1: Lord, you are The God of Peace. Jesus died to give me peace. Peace is my rightful inheritance as your daughter. Peace is a fruit of your Spirit. Please bring peace to my emotions, which are not at this moment peaceful. Prayer 2: Lord, please sanctify my emotions. Sift the way I feel through the truth of Your Word. Prayer 3: Lord, I implore You to be Lord of my emotions. I want you to be Lord of every aspect of my life, and right now I am most aware of needing you to live as Lord of my emotions. I place them into Your Hands. Prayer 4: Lord, do what I cannot do; take this disturbing situation resulting in negative thoughts and emotions and transform it for Your glory and my good. I do not want to be weighed down and distracted with brain clutter. Granted, every unsettling situation requires its own targeted prayer, but I have found the Lord faithful to meet me, right where I am, with His supernatural supply of grace. He welcomes me to bring my emotions to Him. The reassurance that my life is in His Hands, and not in my hands or the hands my own emotions leads me toward the emotional equilibrium needed to move forward. In Him we live and move and have our being (Acts 17:28a). When has the Lord intervened in your emotions and led you to His higher ground? Older PostWill You Go to the Ocean with Me?